The National Fire Protection Association (NFPA) is charged with setting standards for fire prevention and other life-saving emergency endeavors. Its guidelines cover a wide array of hazard-related recommendations and regulations, with some 300 codes and standards designed to minimize the risk and effects of fire by establishing criteria for building, processing, design, and other activities in the United States, as well as many other countries, according to the NFPA. Many Americans are vaguely aware that something called the “fire code” exists, but few are remotely aware of where it comes from. While local, state, and federal authorities establish their own fire-prevention and emergency laws and codes, they pretty much all base their rulemaking on NFPA Codes and Standards. The NFPA has more than 200 technical code- and standards-making committees, which are staffed by over 6,000 volunteers who are experts in each particular area of concern. The most well-known, and longest lasting, set of guidelines is NFPA 1, the Fire Code, which provides a “comprehensive, integrated approach to fire code regulation and hazard management.” When the NFPA was formed in 1896 by a group of insurance firms, their first initiative was to establish guidelines for fire prevention and safety. The current edition of NFPA 1 was last updated in 2012 and is under committee review until its next update in 2015. It “advances fire and life safety for the public and first responders,” and it covers “the full range of fire and life safety issues from fire protection systems and equipment and occupant safety in new and existing buildings to hazardous materials, flammable and combustible liquids,” and more. NFPA 10: Standard for Portable Fire Extinguishers, The provisions of this standard apply to the selection, installation, inspection, maintenance, recharging, and testing of portable fire extinguishers and Class D extinguishing agents. NFPA 12: Standard on Carbon Dioxide Extinguishing Systems. This standard contains minimum requirements for carbon dioxide fire-extinguishing systems. NFPA 12A: Standard on Halon 1301 Fire Extinguishing Systems. This standard contains minimum requirements for total flooding Halon 1301 fire extinguishing systems. It includes only the essentials necessary to make the standard workable in the hands of those skilled in this field. NFPA 13: Standard for the Installation of Sprinkler Systems. This standard shall provide the minimum requirements for the design and installation of automatic fire sprinkler systems and exposure protection sprinkler systems covered within this standard. NFPA 14: Standard for the Installation of Standpipe and Hose Systems. This standard covers the minimum requirements for the installation of standpipes and hose systems. This standard does not cover requirements for periodic inspection, testing, and maintenance of these systems. NFPA 17: Standard for Dry Chemical Extinguishing Systems. This standard includes minimum requirements for dry chemical fire-extinguishing systems that discharge dry chemical from fixed nozzles or hand hose lines by means of expellant gas. NFPA 17A: Standard for Wet Chemical Extinguishing Systems. The provisions of this standard apply to the design, installation, operation, testing, and maintenance of pre-engineered wet chemical fire extinguishing systems that discharge wet chemical from fixed nozzles and piping by means of expellant gas. It contains only the essential requirements and recommendations needed to make the standard workable in the hands of those skilled in this field. NFPA 20: Standard for the Installation of Stationary Pumps for Fire Protection. This standard deals with the selection and installation of pumps supplying liquid for private fire protection. NFPA 25: Inspection, Testing, and Maintenance of Water Based Fire Protection Systems: Baseline for inspection, testing, and maintenance of water-based fire protection systems. NFPA 70: National Electric Code: The world’s most widely used and accepted code for electrical installations. NFPA 72: National Fire Alarm and Signaling Code: Provisions to meet society’s changing fire detection, signaling, and emergency communications demands. NFPA 80: Standard for Fire Doors and Other Opening Protectives. This standard regulates the installation and maintenance of assemblies and devices used to protect openings in walls, floors, and ceilings against the spread of fire and smoke within, into, or out of buildings. NFPA 96: Standard for Ventilation Control and Fire Protection of Commercial Cooking Operations. Provides preventive and operative fire safety requirements intended to reduce the potential fire hazard of both public and private commercial cooking operations. NFPA 101: Life Safety Code: Establishes minimum requirements for new and existing buildings to protect building occupants from fire, smoke, and toxic fumes. NFPA 720: Standard for the Installation of Carbon Monoxide (CO) Detection and Warning Equipment. This standard covers the selection, design, application, installation, location, performance, inspection, testing, and maintenance of carbon monoxide detection and warning equipment in buildings and structures. This standard contains requirements for the selection, installation, operation, and maintenance of equipment that detects concentrations of carbon monoxide that could pose a life safety risk to most occupants in buildings and structures. 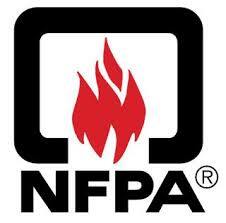 NFPA 2001: Standard on Clean Agent Fire Extinguishing Systems. This standard contains minimum requirements for total flooding and local application clean agent fire extinguishing systems. It does not cover fire extinguishing systems that use carbon dioxide or water as the primary extinguishing media, which are addressed by other NFPA documents. These codes are all under constant review to keep up with changes in technology, materials, construction practices, and other relevant variables to provide the latest and most comprehensive fire safety standards possible. From small towns to enormous cities, lawmakers and planners count on the expertise of the NFPA to make recommendations that will save lives and reduce injuries from fires and other dangers. That’s what makes NFPA Codes and Standards so important to all of us.